Critical Role, the acclaimed and influential livestream series led by Matthew Mercer, concluded its long and awesome 3+ year campaign with an epic battle against Vecna. Even if you have never watched it, you probably know that it has a huge legion of fans who care greatly about the show, the narrative, the characters, and each session’s outcome. And if you follow or happen to have seen the tweets by any of the players, you know the players were also heavily invested in the show. The best capture of the emotional investment is this video where Matthew Colville reviews the conclusion and walks through a key moment and it’s emotional underpinning. Even if you never watched CR, episode 114 is worth watching, as is this analysis (which includes clips of the finale). I watched the finale, loved it, and particularly loved that it showcased the emotions of the players as they took on Vecna. Colville reveals how what at first seems to be a background moment is actually a deeply moving emotional moment for two of the characters. It’s a huge strategic moment, but the real meaning brings players to tears. This is the moment where you should stop reading the blog and go watch it, before I spoil it for you. Last chance. Matthew Colville really does a great job. I’m going to spoil it below, but I’m also going to share why I really like emotional investment in RPG campaigns and some of the ways to go about creating it. 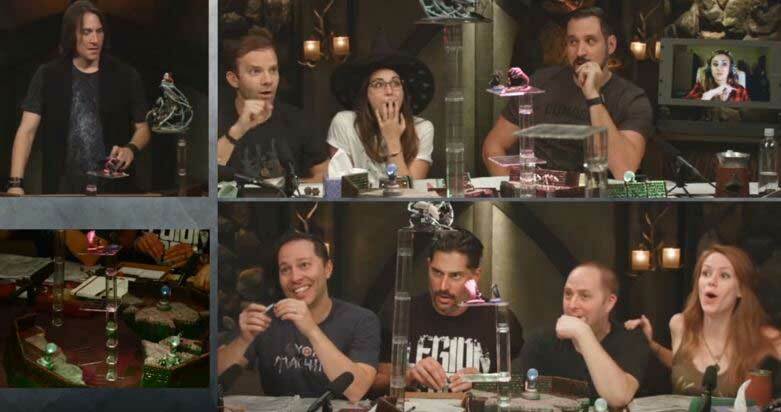 If you watched the finale or Colville’s analysis, you saw how the bard Scanlan, played by Sam Riegel, tries to counter Vecna teleporting away. Because this is so incredibly important, with defeating Vecna being the most important goal, Sam uses his sole 9th level slot to counterspell Vecna’s teleport without a chance of failure. Just considering doing it almost brings Sam to tears. Amidst the chaos of the game, no one else notices how difficult a decision it is, because of an earlier plot point. Liam O’Brien’s character, Vax’ildan, had been returned to the game as a revenant by the Raven Queen, on the condition that Vax’ildan was returned only until Vecna died. Scanlan’s use of counterspell means he cannot use that 9th level spell slot to cast wish to keep Vax’ildan alive. The cost of that decision is deeply emotional for Sam the player, as it surely is for the character. It is a moment that is so bittersweet that Matthew Colville can’t help tear up and I can’t help tear up watching him talk about it. This is what happens when the game really matters to us. I’ve had the fortune of being in emotional campaigns, and also running emotionally rich content. My co-author for Jungle Treks, Eric Menge, once wrote an adventure with a moment so sweetly painful that it tears me up to think about it. I ran the adventure several times and each time I could not help but choke up. It was the culmination of years of play, involving an NPC to which the PCs had many ties. Several players wept at my tables, and one player swore to become a DM (and did) because that adventure moved him so much. He wanted to give other people such experiences. If you have never had such an emotional reaction to a game, you are not alone. Many campaigns, including most organized play, doesn’t create that attachment. If you started a home campaign or organized play season getting to know one NPC… and then lost track of them, if you found yourself really not caring about the secrets an NPC was revealing, if you felt like the choices your character made didn’t have lasting effects… then some opportunities were lost to have a greater emotional impact. Not everyone wants that emotional investment. That’s okay too. For when you do, read on. This is what Critical Role’s DM, Matthew Mercer, did. Before that amazing Vecna moment could happen, he laid the emotional condition that a player could come back to life (as a revenant) only until their mission was done. Even if a wish spell had returned him to full life, playing on borrowed time changes how a player looks at their character and creates emotional opportunity. DMs running Tomb of Annihilation can see some opportunities here with the NPC Nanny Pu-Pu. Without revealing too much, think about what her offer can create emotionally, and how it might become even more emotionally significant later. An old Living Greyhawk adventure, Shades of Grey, revealed one of the kingdom’s greatest secrets – why there was an army of undead protecting one of its borders. The answer was the spirits of the soldiers were enslaved by a servant of Vecna. When the party finds out, it is the eve of a critical battle against the giants who have overtaken their capital city. They have three choices: 1) free the spirits, so they no longer suffer and continue to the afterlife as they desire. 2) Keep the spirits here, guarding the border. 3) Force the spirits to attack the giants, possibly tipping the scales towards winning the battle. My table agonized over the decision. As players, every one of us wanted to win the upcoming battle (itself a huge battle interactive). We knew the admins were likely weighing this adventure into the results. But, the way it was written was so compelling we argued for more than 15 minutes. Each of us felt and learned what our character (not just the player) would do and why. It reminds me of what my friend Steve Pearce said is one of the definitions of a great adventure: it teaches you something about your character. In the end, enough tables decided to free the spirits. As a result, we did not retake the capital from the giants. A huge decision, big sacrifices, big emotions, consequences. A tried and true method is to have the typical adventure McGuffin (the thing the PCs must get to stop the evil bad boss) have a dual purpose. Sure, it can defeat the villain… but it can instead restore a dead PC or NPC to life. Which will they choose? You can develop many variants of this kind of plot choice. In my 4E Dark Sun home campaign, Crown of Sorrow, I started the characters off in their home village. Each of them developed backstory regarding their ties to the village, and each had the opportunity to develop NPCs or create ties to NPCs. As the plot matured they had to make decisions that often took them away from the village to resolve greater challenges. At one point they chose to leave their village when it was in possible danger. When they returned, it was devastated. Nearly half of all inhabitants were killed and many captured and taken. One character, Rensade, found that his mentor and caretaker, the wise woman Grisha, had been killed. It was an emotional moment. (I think the player was more than a bit mad at me). Rensade buried Grisha next to her prized faro cactus, which had yet to bloom. The next time they returned, it was in full bloom. Only Rensade could sense Grisha calling him to eat the fruit. When he did a portion of her soul merged with his, changing him and renewing that emotional link. You don’t have to create emotional moments each time. It can be more effective to lay the seeds and, when the time is right, activate them. Many times, the players will activate them on their own, as happened with Critical Role. Sometimes an opportunity won’t be taken. One of my Tomb of Annihilation players has a PC who is a member of the Order of the Gauntlet. When at a camp where the Order of the Gauntlet commander was clearly incompetent and even dangerous, I had a huge battle scene. In the thick of it, I described how an undead creature was about to take out the commander and I asked the PC what they would do. Had they let the commander die, they might have become the leader of the camp and become very important in the organization. It was dark and no one else would have known. The PC chose to save them. It wasn’t a missed opportunity, because now the commander is a better person and owes him his life. The emotional payout can still happen later. If you try to stay aware of emotional opportunities and cultivate them, they will eventually come together. When you develop NPCs, think about how they may create emotional attachment. And as PCs meet NPCs, keep an eye out for the ones that interest players. A strong dislike or like can be worth strengthening over time. Can they become mentors? Guides? A moral compass? Could they secretly be a family member? What would a soap opera do? The wretched noble can become one of the villains, or suddenly reveal the secret reason (maybe an endearing one) why they became such a wretched person. When possible, have NPCs develop as a consequence of PC actions. The wretched noble redeeming themselves and pledging themselves to the cause of good is the perfect emotional foundation for something very terrible to threaten them… or their innocent loved ones. Pay attention to what great TV shows do to play with and against audience expectations and mimic that development in response to the adventurers. Build up NPCs so that the fun tropes such as rescuing an NPC from the clutches of evil really matters. The more that failure personally matters to the characters, the more they will enjoy that experience. The entire Death Curse in Tomb of Annihilation has fantastic potential beyond that provided in the adventure. Cultivate attachments to NPCs and consider how it will resonate with the players if some of them are threatened by the Death Curse. Some of the guides introduced in the adventure have really interesting stories. How can they rise, fall, and be redeemed in tandem with the party’s choices? How can their stories resonate with the players such that the players really care about their fate? During the Dark Sun Ashes of Athas organized play campaign we made a big mistake. We meant to focus on the town of Altaruk for a long enough time to create any emotional attachment to the town. We failed to do that sufficiently – a missed opportunity. As awesome and memorable as emotionally rich moments can be, they aren’t for everyone. Watch your players and dial it down for those that don’t enjoy the moment. Young kids often won’t enjoy such significance and can clam up when the situation seems too real and too important. 5E’s official adventures are classics, but they often miss out on emotional ties by keeping the party on the go. NPCs are introduced but fade away. Compelling locations are left behind. If you want greater emotional significance, you may need to create stronger links. Consider combining two NPCs at different locations into one NPC, who travels to stay near the PCs. Find ways to give a location a “home base” feel, even if the PCs won’t stay for long. Have factions or other allies bring news from previous locations and NPCs to the PCs, keeping past actions relevant, then bring those past aspects back to the foreground when appropriate. Ideally, look to the characters for ways to develop ties – how could their choices and actions keep prior NPCs and locations relevant and emotionally active? Let players develop scheme, plans, and goals… then bring developments that will create emotional relevance. Creating emotional investment takes practice. Develop this skill over time. Work at your campaign so that players first care about the story, see the campaign as responsive to them, and start to engage. Those foundations are critical. Power Score RPG ran one of the Jungle Treks adventures, Beautiful Plumage, on his livestream! Watch Jungle Treks being played here! D&D launched a survey of Adventurers League! Even if you have never participated in organized play, please take the survey! 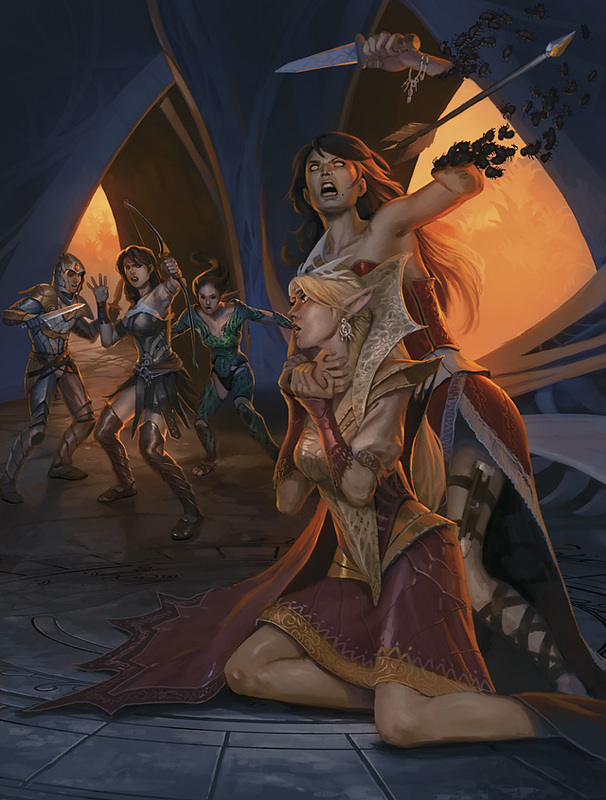 Even if Xanathar’s Guide to Everything just released with tons of new options, a new Unearthed Arcana article is up and looks at Elf Subraces. Speaking of Matthew Mercer, he released a new pay-what-you-want supplement on the Guild – The Lingering Soul offers a class you can take after your character dies. As always, I appreciate your support of my work! Click on the image below! This entry was posted on November 16, 2017 by Alphastream and tagged 3E, 4E, 5E, Ashes of Athas, Crown of Sorrow, Greyhawk.